I own 3 tenkara rods. Not a massive collection, but obviously more than one. While all are short by tenkara rod standards, each has its role. The Tenkara USA Iwana is my "everyday" rod. The Sakura Kongo is the compact pack rod (it's also stiff, so is a good "wind" rod). Finally the Fountainhead Caddis is the "loaner" rod. The rod I'll happily let someone else use if they want to give tenkara a try. Sadly, these 3 rods had been spending their "off-days" hiding in rod tubes or socks, which is a shame because they're all kinda pretty. At least as far as fishing rods go. I had wanted to purchase a rack to store/display them, but they don't really fit in "normal" fishing rod racks. By nature, when collapsed, tenkara rods are kinda short. 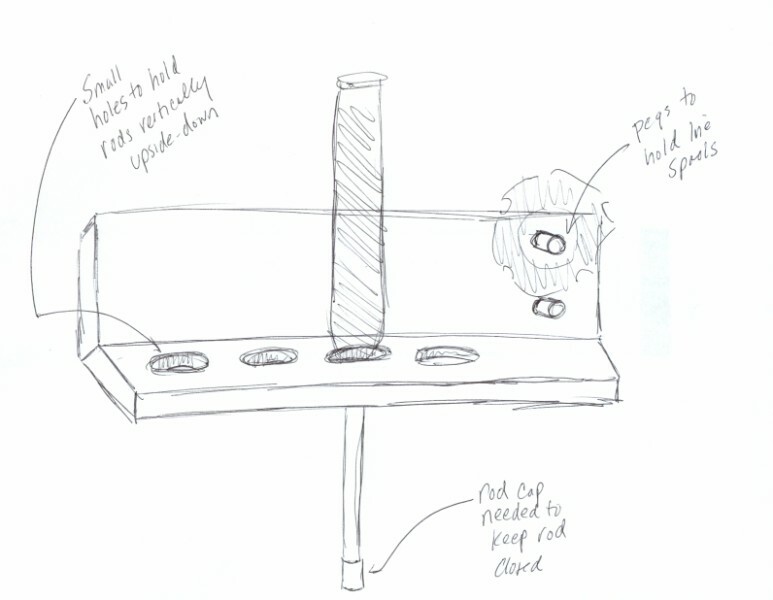 I had sketched a simple rod rack I thought I'd make from a piece of wood. Just drill some largish holes in the top and slide the rods in upside down. Sure, I'd need the rod caps to do this (or else the upside down rods would want to telescope out per gravity's request), but since I had them I didn't think it would be such a big deal. 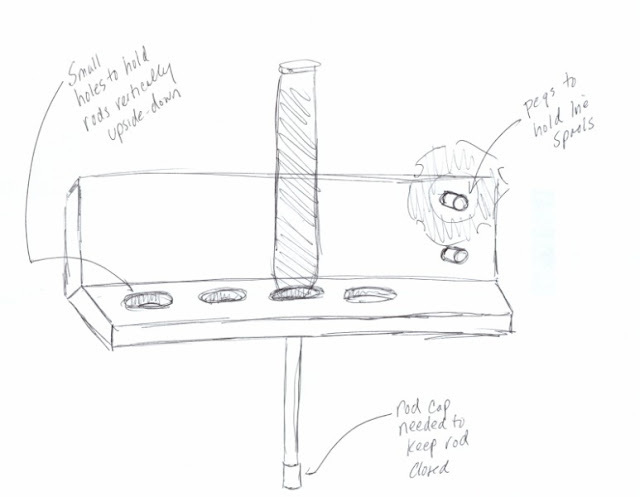 Posting that drawing over at Tenkara-Fisher, Daniel from Tenkara USA suggested looking into a billiard cue rack. Thinking this would make sense, and not really looking to reinvent the wheel (thanks Daniel! ), I went that route instead. Sportcraft Billiard Cue Rack from the land of W.
The only real drawback I've found is that there is no way to store the rods if you want to keep your line attached to a spool. The rack is just not deep enough to accommodate the spool resting on the upper grip. Perhaps if you prefer the EZ-Keeper method of line storage, it may work. I don't, so I couldn't test it to find out. 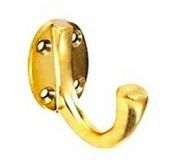 Instead, I'm going to get some small screw-in hooks to mount on the bottom of the lower bracket to hold my line spools...you know...something like this. In the future, I may look into getting an inexpensive shelf like below to replace the lower bracket all together, as well as store the spools, line, perhaps a fly box - while still using the upper bracket to keep the rods standing upright. However for now, this under $10 setup works fine, and thought it might be something my tenkara toting friends may have interest in. 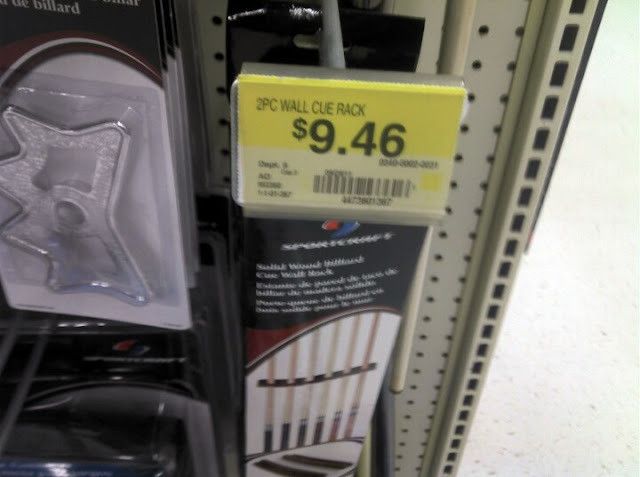 What if you simply add a spacer between the wall and the racks? You could then leave your line spools on the rod grips, and not have the wall interfere? 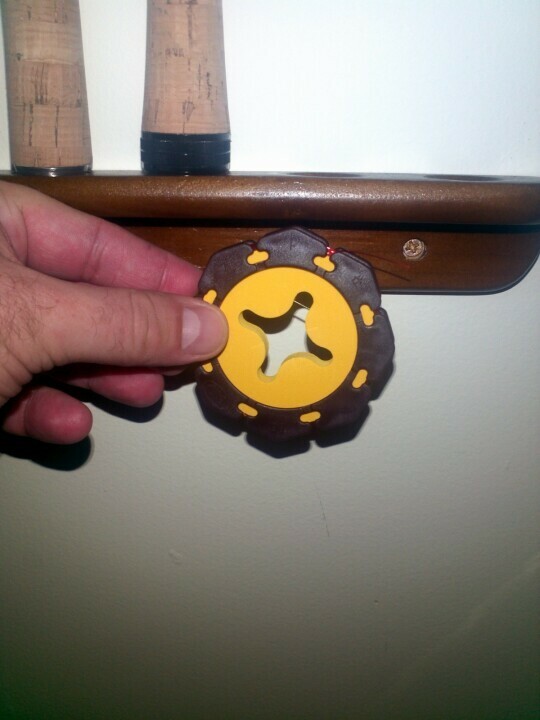 You could use liquid nails or some other strong glue/epoxy to hold the two pieces together, and then screw it to the wall as a unit. Simple thick, square blocks of whatever wood you get cheap would work, or attach multiple pieces of scrap together until you get the required thickness to allow for spool-mounting. Definitely a good call on your part. If someone does want to store spool on rod, that's a great (and simple) solution. I personally don't store my line on my rod at all when not fishing, don't like to expose the delicate rod tip more than I need to, so I'm still going to get some hooks in the short term. I also have about 5 or 6 spools of line vs. the 3 rods, so need somewhere to keep the extras. Just poke a hole through the drywall. when she notices, it will be too late to stop you. That looks like a great set up but I am personally most impressed that you knew that was a spice rack! lol! That's a great idea - Is that one of Joel's prints above it? Considering on the other side of the wall is an unfinished storage room, I could probably do that. Those rods souls were ruined once I got my grubby mitts on them. We're domesticated in these parts. That would be a Joel DeJong print. Good eye! Mike, that rod rack is awesome and I want one for my fishing room! What brand is it? It's from Sportcraft. It was the only type they had in my Walmart. I'm sure if you checked out a billiard supply website they'd have several different options. A table-top (or desk top) display rack made on a Lazy Susan base, with a pillar in the center, and a smaller diameter, notched ring in the top, and sculpted divots in the base for the base of the rod handles to go into. They would lean in toward the center of the unit. Just give it a spin to pick your rod. I'm thinking that a typical dining table size Lazy Susan could store upto 10 rods or so - should someone have that many Tenkara rods. Could be a neat display for home, or for a fly shop. You could get fancy, and put a narrow spire coming from the center, and put some sort of fish sculpture, a large fly, or whatever on it. Damn, I think I need to get one for my tenkara rods too, although I need one for more than 6 cues... Can't believe I have already that many rods. Very cool idea. That sounds like a killer idea for the motivated! 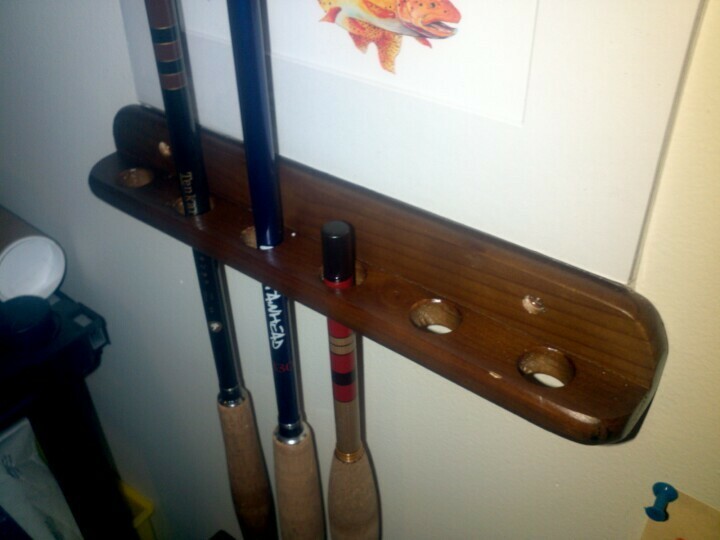 I have a cue rack...but it is already being used on the wall...Oh well, no tenkara rods to put into it anyway. I really like the illustration. Such detail and artistic talent! I think this is a great idea that I will need to try out. Not Going to take my cue rack down though as I will then have no place for my cues. Maybe I can find one at a yard sale. 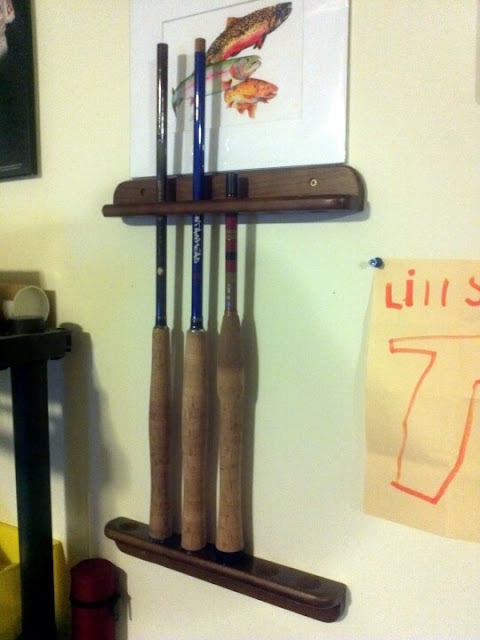 Catching up with some past posts and recognised something with that great idea for a rod rack. Thanks for the subliminal plug and the great idea for cheap (that's key) rod rack. My 2 tenkara rods thank you. Fantastic idea, I'm sure I have an old pool cue rack in the shed somewhere, gonna dig it out and fit it in the garage! That's a really neat storage rack DIY.